Contrary to Time‘s recent “Chore Wars” article, which claimed that these days, men do an equal share of the household labor, I suspect that men may do plenty of chores, but that we ladies still do the true majority. Do I have dozens of studies to back up this blog here? No. What I do have are all the gaps “Chore Wars” fails to address, and everyday experience with other women. Get ready for my rant. I mentioned in a prior post about my disdain for cooking and, subsequently, domestic household duties. I have tried to instill some basic household organization by trying to maintain basic cleanliness and order, but when you have a kid, that’s pretty much impossible. Between the toys, the papers, and the stuff they collect, it’s a never-ending battle you probably can’t win and shouldn’t fight anyway. Read More Get A Job! Posted on Tuesday, February 15th, 2011 Tuesday, February 15th, 2011 Author rosasparksCategories ParentingTags adage, chores, cleanliness and order, disdain, first thought, household duties, household organization, how to do anything, little ones, parenting, raising responsible kids, sexism, wii9 Comments on Get A Job! Yesterday while I was high on endorphins during an especially a wesome workout I was getting really pumped up and was like “This is the first day of February! I should work out every day in February! It’s totally manageable because it’s the shortest month! I will call it Fitness February! Endorphins! Weeeeee!! !” Then I jumped around a little because I was hopped up on dopamine and was having difficulty containing my energy. You know how I’m going to track my goal? A star chart! 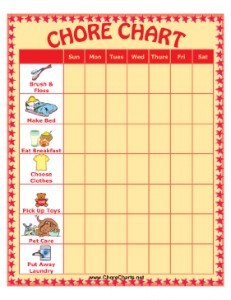 Yes, the chart you have on the fridge for your kids to do their chores. 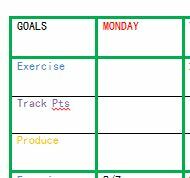 I love star charts for making and keeping track of goals. It doesn’t have to be fitness either, it can be any goal your little heart desires. And it doesn’t have to be an every day thing, it could be that you want to work out 3 days a week. That’s a great star chart goal too. Here’s how I like to do it. 1. Get a specific goal. Similar to New Year’s Resolutions, all goals are easier to maintain and track if they are specific. My goal of Fitness February isn’t enough, I needed to define Fitness so I don’t cheat myself out of accomplishing as much as I could. I decided that exercise must be at least 30 continuous minutes in the form of either a visit to the gym or a work out video. 2. Write It Down. Self-explanatory. Put it somewhere visible. Mine is on the fridge. 4. Come up with a reward. Honestly, for me, just getting the stickers is pretty satisfying, but I like to come up with a reward for myself once I’ve met my goal. Anything you want. I usually like to make it something a little self-indulgent because you want to feel motivated and you deserve it! 5. Watch the stickers stack up! Be proud of yourself. Star charts are fun!